Chatham-born artist Brian Jones decided to become a painter at age 18, when he read an article about Alex Colville in Canadian Magazine. Determined to achieve this goal, he moved to London, Ontario, where he enrolled in H.B. Beal Technical and CommercialHigh School and sold paintings to meet his $75 monthly rent. Initially a photorealist, Jones apprenticed briefly with Jack Chambers. He gradually developed a more stylized approach that, through both elongation and expansion of the human figure, conveyed scenes of everyday life in Southwestern Ontario with gentle humour. 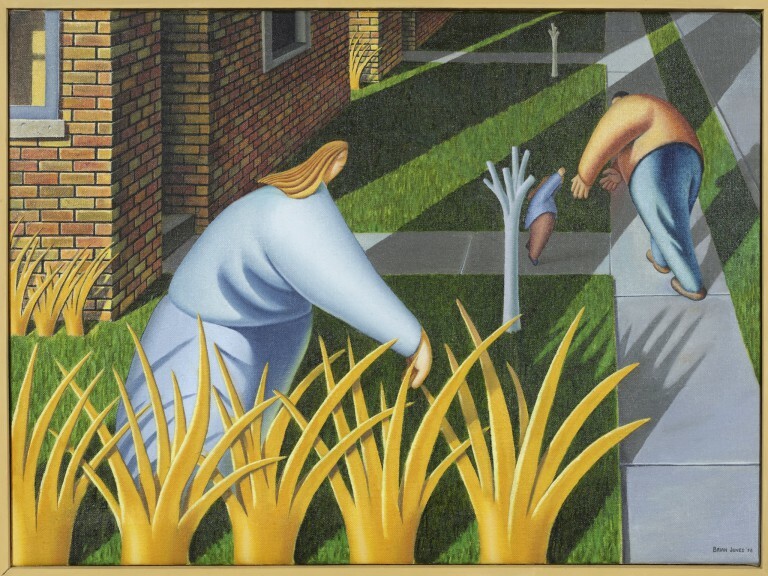 Yard Scene #1 clearly demonstrates what Jones called his “Neighbours Style”: rounded human forms performing ordinary activities, their curving forms and reaching arms providing strong contrast to the uniform, hard-edged brick buildings they live in. Plants and trees are clearly cultivated, as if they are not permitted to grow in natural disorder. Shadows provide spatial depth but also flatten the painting with their strong graphic patterns. Even as it consoles viewers with its familiarity, this scene points out the rigidity of structures shaping urban life—structures that protect but perhaps also confine the life within.